Marie from Emma Calls Me Mama is having an Heirloom Party! the mountains of Canada in the background, the river, the fish, the basket, I think it looks like a picture out of a River Runs Through It, don't you think? I would love to play around in photoshop with it and get a big print of it someday. The next pieces are in my girls room: I got this bedroom set from my great-grandma because I was the first great-grand daughter on my dad's side. She had it for her daughter, Thelma when she was little, so it was built in the 1930's or 40's. I had it in my room when I was little, then my younger sisters did, and now we have it again for my daughters. I love it and have so many memories at that little vanity. :) The plan is to tackle my girls' bedroom next, and I'm not quite sure what to do with this set. but I'm afraid to strip it if it's lead paint. So, I guess my first step would be to see if the paint has lead in it and then go from there? Have any of you worked with a piece like this? I would love to hear any tips you have...I would love to give them some new life. What a beautiful piece of furniture! A great treasure!! WOW! What beautiful furniture and how neat to have it be in your family for so long. Wow. WOW! I love the old photo. His hat is so neat. 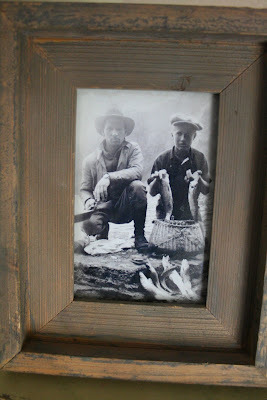 :) I think old photographs are so intriguing. In love with it all. Special pieces with special memories!! 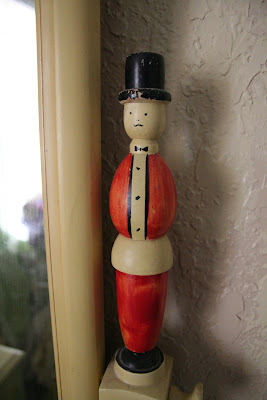 The men in top hats... what an unexpected detail to your pieces. 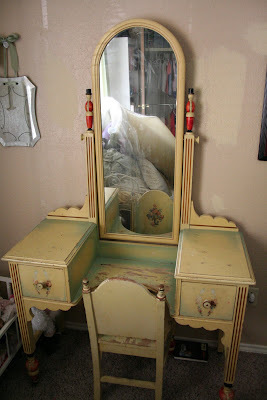 I love this vanity, there is SO much you could do to it, but it's fun to see it in it's original state! Wow! Those are awesome! Pictures are always great heirlooms! I love that! And your furniture is so cool!!!! What wonderful memories they must bring! I would think twice before painting it. Do you ever watch the Antiques Roadshow? They are always reprimanding people for painting old pieces as the value drops considerably. It's so charming the way it is. I love the bedroom set. 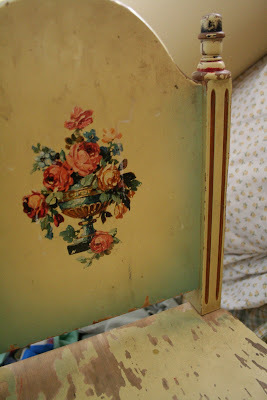 I am almost always a fan of painting furniture, but in this case, I wouldn't. Even with the wear, the pieces look special. 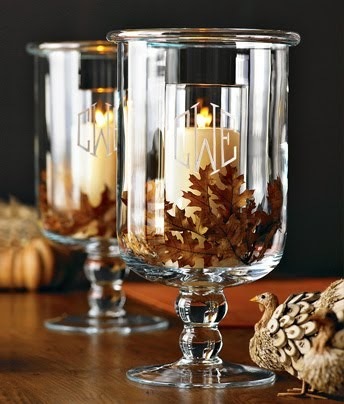 Oh how lovely ~ what special pieces to have in your home. Oh, that bedroom set is so pretty! I think you should leave it alone - it looks beautifully shabby! Love the photograph, too. I remember that from when we were kids. Priceless! Hello Melissa - thank you for joining the party! The vanity and dresser are so fabulous! I love them. Oh the details abound on these pieces! I wouldn't do anything to them...they look precious just as is! Back away from the paint. LOL. Love the floral painted designs. And oh my, those little men with top hats? How SWEET is that? The serve as legs? How very unique. I think the old picture of your Grampa is priceless. What a neat photo. I agree it is beautiful as it is, but not in terrific shape. 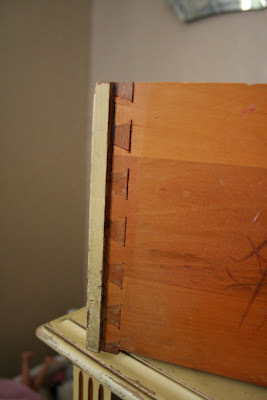 What about applying a crackle finish to keep the color but hide the dirty/scraped sections. Good Luck! I love the picture of your grandpa! Love your heirlooms! Especially that great picture! Oh, so sweet. I love that furniture. You know what I would do? I would just prime it with KILZ and then paint it. I don't think the lead paint is a worry unless you sand it (releasing dust) or chew on it. So I'd skip the sanding and make sure that no one's chewing on it. It has such pretty lines--I think it would be gorgeous painted. And I love your photograph! I lost my grandfathers when I was just a girl, too. You're lucky to have this neat old photo. Kilz is a good idea. It is such a beautiful set. I love the furniture. I had some old pieces but didnt bring them when I moved and when my mom died, my aunt sold everything. I was devestated. It is SO pretty! You do what's best for you! If that appeared on my front stoop, I'd clean it up real good, maybe distress it a tad bit more (which would most likely happen when I was cleaning it "up real good) and then poly it ALL...to preserve. I love the furniture!!!! I would have never thought of lead paint. 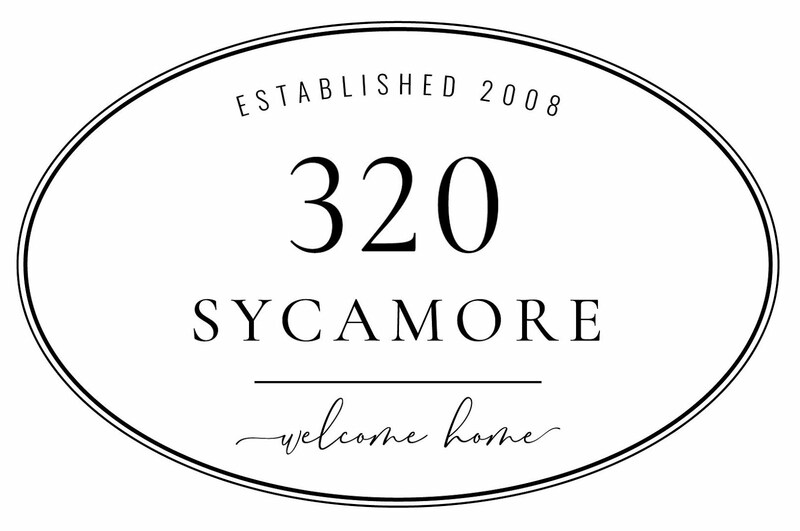 Friendly Advice: Go to my blog and enter the Monday giveaway! What a neat picture, I love old pictures like that. LOVE LOVE LOVE the bedroom set, it is soooo neat! I am helpless though with tips for the paint, sorry. It will be gorgeous though, it's so neat as it is but will look awesome redone. Aw, what sweet things you have from family. I just love that bedroom set. I'm tempted to tell you to leave it alone & not paint it. I really like its shabbiness. Love your heirloom furniture. I like the shabbiness too. I would leave it if you could and work with the vintage goodness. I love that furniture and it all depends on what your desires are for those lovely pieces. Do you want to keep them shabby and create your girls bedroom around those colors and have that theme in their room, keeping the pieces original or does that not matter to you and you would rather have a fresh updated look. 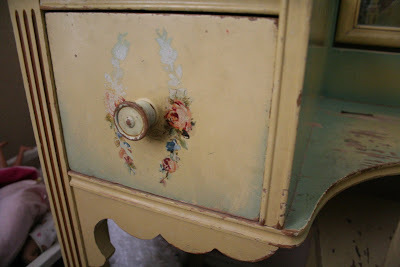 If you were going to paint you could paint some lovely topiaries on the sides and have draping florals cascading down each drawer and add some little onlay applique pieces. My new party button is up--The Knock Off Knock Out starts on Monday Aug 10. Your laundry room would be a great piece to feature. This is way late to post on this, but I just found your blog and was browsing through! 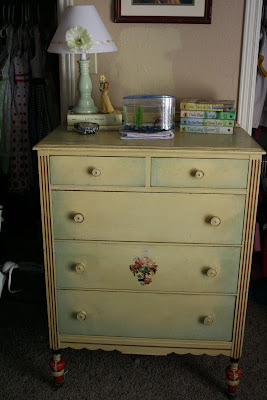 I have a dresser that is incredibly similar to yours- not the same colors, but the shape and detailing are the exact same! I also inherited it from my great grandmother and I had been wondering what to do about updating it as well- it's an olive green with a pale goldenrod trim and flower detail- not exactly a fit in what I thought I wanted for my bedroom at school! But then I just decided to do my room around it instead! It's now the focal point of my pale pink and grey bedroom and I love and appreciate it so much more!